The Berlin Philharmonic (German: Berliner Philharmoniker) is a German orchestra based in Berlin. In 2006, ten European media outlets voted the Berlin Philharmonic number three on a list of "top ten European Orchestras", after the Vienna Philharmonic and the Royal Concertgebouw Orchestra, while in 2008 it was voted the world's number two orchestra in a survey among leading international music critics organized by the British magazine Gramophone (behind the Concertgebouw). The BPO supports several chamber music ensembles. The Berlin Philharmonic was founded in Berlin in 1882 by 54 musicians under the name Frühere Bilsesche Kapelle (literally, "Former Bilse's Band"); the group broke away from their previous conductor Benjamin Bilse after he announced his intention of taking the band on a fourth-class train to Warsaw for a concert. The orchestra was renamed and reorganized under the financial management of Hermann Wolff in 1882. Their new conductor was Ludwig von Brenner; in 1887 Hans von Bülow, one of the most esteemed conductors in the world, took over the post. This helped to establish the orchestra's international reputation, and guests Hans Richter, Felix von Weingartner, Richard Strauss, Gustav Mahler, Johannes Brahms and Edvard Grieg conducted the orchestra over the next few years. In 1887, the pianist and composer Mary Wurm became the first woman to conduct the orchestra. Programmes of this period show that the orchestra possessed only 46 strings, much less than the Wagnerian ideal of 64. In 1895, Arthur Nikisch became chief conductor, and was succeeded in 1923 by Wilhelm Furtwängler. Despite several changes in leadership, the orchestra continued to perform throughout World War II. After Furtwängler fled to Switzerland in 1945, Leo Borchard became chief conductor. This arrangement lasted only a few months, as Borchard was accidentally shot and killed by the American forces occupying Berlin. Sergiu Celibidache then took over as chief conductor for seven years, from 1945 to 1952. Furtwängler returned in 1952 and conducted the orchestra until his death in 1954. His successor was Herbert von Karajan, who led the orchestra from 1955 until his resignation in April 1989, only months before his death. Under him, the orchestra made a vast number of recordings and toured widely, growing and gaining fame. The orchestra hired its first female musician, violinist Madeleine Carruzzo, in 1982. However, Karajan's hiring in September 1982 of Sabine Meyer, the first female wind player to the orchestra, led to controversy when the orchestra voted 73 to 4 not to admit her to the orchestra. Meyer subsequently left the orchestra. After Karajan stood down from the orchestra in 1989, the orchestra offered the chief conductorship to Carlos Kleiber, but he declined. In 1989, the orchestra elected Claudio Abbado as its next principal conductor. It was the first time the Philharmonic resorted to democratic voting after the fall of the Berlin Wall in 1989. He was known to be humorous in his first months at the Philharmonic. He expanded the orchestra's repertoire beyond the core classical and romantic works into more modern 20th-century works. Abbado stepped down from the chief conductorship of the orchestra in 2002. During the post-unification period, the orchestra encountered financial problems resulting from budgetary stress in the city of Berlin. In 2006, the Orchestra Academy of the Berlin Philharmonic established the Claudio Abbado Composition Prize in Abbado's honour. In June 1999, the musicians elected Sir Simon Rattle as their next chief conductor. Rattle made it a condition of his signing with the Berlin Philharmonic that it be turned into a self-governing public foundation, with the power to make its own artistic and financial decisions. This required a change to state law, which was approved in 2001, allowing him to join the organization in 2002. Rattle's contract with the orchestra was initially through 2012. In April 2008, the BPO musicians voted in favour of retaining Rattle as their chief conductor through 2018. From 2006 to 2010, the general manager of the orchestra was Pamela Rosenberg. In September 2010, Martin Hoffmann became the orchestra's new Intendant. Hoffmann stood down as its Intendant after the close of the 2016/2017 season. Andrea Zietzschmann took up the post as his successor. In 2006, the orchestra announced it would investigate its role during the Nazi regime. In 2007, Misha Aster published The Reich's Orchestra, his study of the relationship of the Berlin Philharmonic to the rulers of the Third Reich. Also in 2007, the documentary film The Reichsorchester by Enrique Sánchez Lansch was released. UNICEF appointed the Berlin Philharmonic Orchestra and Rattle as Goodwill Ambassadors in November 2007. On 10 January 2013, the orchestra announced the scheduled end of Rattle's tenure as artistic director and chief conductor in 2018. In 2014, the orchestra founded its own label "Berliner Philharmoniker Recordings". After an abortive first attempt on 11 May 2015, the orchestra on 21 June 2015, elected Kirill Petrenko as its next artistic director and chief conductor. In October 2015, the orchestra announced that Petrenko was to formally commence his contract as chief conductor with the 2019/20 season. A year after this news, in October 2016, the orchestra specified more precisely the start of Petrenko's tenure as 19 August 2019. The orchestra's first concert hall, the Philharmonie situated on the Bernburger Straße in Berlin Kreuzberg, was inaugurated in 1882 in a building previously used as an ice rink and converted by the architect Franz Schwechten. In 1898, a smaller concert hall, the Beethovensaal on Köthener Straße, was also inaugurated for chamber music and chamber ensembles. The first Philharmonie was used until British bombers destroyed it on 30 January 1944, the anniversary of Hitler becoming chancellor. The orchestra played until the end of the war in the Staatsoper, Unter den Linden. The Staatsoper was also destroyed on 3 February 1945. In need of a venue, the Berlin Philharmonic played during the years following the war in the Titania-Palast, an old movie theater converted in a concert hall, and still used the Beethovensaal for smaller concerts. During the 1950s the orchestra moved its concerts at the Musikhochschule (today part of the Berlin University of the Arts), in the Joseph-Joachim-Konzertsaal. However, most of the recordings were done at the Jesus-Christus-Kirche in Berlin Dahlem, celebrated for its acoustics. The need for a new Philharmonie was expressed since 1949, when the Gesellschaft der Freunde der Berliner Philharmonie e.V. (Friends of the Berliner Philharmonie Society) was created to gather funds. The building of the new Philharmonie started in 1961, following the design of architect Hans Scharoun, and it was inaugurated on 15 October 1963, with a performance of Beethoven's Ninth Symphony, conducted by Herbert von Karajan. Its location made it part of the Kulturforum, and the great hall (2,440 seats) was then complemented by a chamber-music hall, the Kammermusiksaal (1,180 seats), built in 1987, following the design of architect Edgar Wisniewski, after a project by Hans Scharoun. The Berliner Philharmonie has since been the home of the Berlin Philharmonic, and its symbol. The orchestra's logo is based on the pentagon-shape of the concert hall. On 20 May 2008, a fire broke out at the Philharmonie. One-quarter of the roof underwent considerable damage as firefighters cut openings to reach the flames beneath the roof. The hall interior also sustained water damage, but was otherwise "generally unharmed." The firefighters limited damage by the use of foam. The orchestra was restricted from use of the hall for concerts until June 2008. On 18 December 2008, the orchestra announced the official creation of a Digital Concert Hall. This hitherto unique internet platform of the BPO enables persons with computer access all over the world to see and hear the Philharmonic's concerts, live or on demand, not only under recent conductors, but even previous concerts conducted, e.g., by Claudio Abbado. Since July 2014, the Digital Concert Hall additionally offers livestreams produced from HD movies of concerts by Herbert von Karajan in the 1960s and early 1970s. Since 2010, selected concerts of the Berlin Philharmonic have been transmitted live to cinemas in Germany and Europe. ^ Matthew Westphal (10 October 2006). "The Top Ten European Orchestras, According to Ten European Media Outlets". Playbill Arts. Archived from the original on 12 February 2013. Retrieved 7 August 2017. ^ Tom Huizenga (21 November 2008). "Chicago Symphony Tops U.S. Orchestras". NPR. Retrieved 8 January 2009. ^ "First woman at the conductor's desk". berliner-philharmoniker.de. Retrieved 3 November 2017. ^ Donal Henehan (23 January 1983). "Women Are Breaking the Symphonic Barriers". New York Times. Retrieved 14 October 2015. ^ Kate Connolly (10 November 1999). "Band of no gold". The Guardian. Retrieved 17 August 2007. ^ Matthew Westphal (6 November 2006). "Berlin Philharmonic Names Winner of First Claudio Abbado Composition Prize". Playbill Arts. Retrieved 1 September 2007. ^ Andrew Clements (24 June 1999). "Picking up the baton". The Guardian. Retrieved 17 August 2007. ^ Charlotte Higgins (29 April 2008). "Berlin Philharmonic keeps Rattle". The Guardian. Retrieved 30 April 2008. ^ Catherine Hickley (24 April 2008). "Rosenberg Will Leave Berlin Philharmonic; Rattle Negotiates". Bloomberg News. Retrieved 28 April 2008. ^ "Neuer Intendant der Berliner Philharmoniker" (in German). Berlin Philharmonic. 19 June 2009. Archived from the original on 9 June 2011. Retrieved 28 July 2010. ^ "Change of general manager in 2017/2018 season" (Press release). Berlin Philharmonic Orchestra. 29 February 2016. Retrieved 27 March 2016. ^ "Setting course for a time of change – Andrea Zietzschmann is the new general manager of the Berliner Philharmoniker" (Press release). Berlin Philharmonic Orchestra. Retrieved 3 November 2017. ^ Agence France-Presse (1 May 2007). "Berlin Philharmonic Orchestra to probe Nazi-era history". European Jewish Express. Archived from the original on 29 September 2007. Retrieved 17 August 2007. ^ Tony Paterson (28 August 2007). "Berlin Philharmonic 'was obedient servant of Hitler'". The Independent. Archived from the original on 30 August 2007. Retrieved 1 September 2007. ^ Das Reichsorchester on IMDb . ^ UNICEF: UNICEF appoints Berliner Philharmoniker Goodwill Ambassador, 17 November 2007. 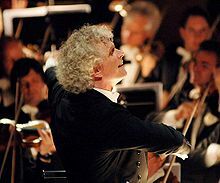 ^ "Sir Simon Rattle to step down as Berlin Philharmonic chief conductor in 2018". Grammophone Magazine. Retrieved 10 January 2013. ^ Louise Osborne (11 May 2015). "Berlin Philharmonic deadlocked over Simon Rattle's successor". The Guardian. Retrieved 22 June 2015. ^ "Congratulations to Kirill Petrenko! The Berliner Philharmoniker are delighted to announce their new chief conductor" (Press release). Berlin Philharmonic Orchestra. 22 June 2015. Retrieved 22 June 2015. ^ Ben Knight (22 June 2015). "Kirill Petrenko to succeed Simon Rattle at the Berlin Philharmonic". The Guardian. Retrieved 22 June 2015. ^ "Kirill Petrenko will take up office as chief conductor and artistic director of the Berliner Philharmoniker in the 2019/2020 season" (Press release). Berlin Philharmonic Orchestra. 13 October 2015. Retrieved 14 October 2015. ^ Matthias Wulff (13 October 2015). "Kirill Petrenko kommt später als erwartet nach Berlin". Berliner Morgenpost. Retrieved 14 October 2015. ^ "Kirill Petrenko unterzeichnet Vertrag" (Press release). Berlin Philharmonic Orchestra. 6 October 2016. Retrieved 7 February 2017. ^ "Andrea Zietzschmann neue Intendantin ab 2017" (Press release). Berlin Philharmonic Orchestra. 6 October 2016. Retrieved 7 February 2017. ^ "Weichenstellungen für die Zeitenwende – Andrea Zietzschmann ist die neue Intendantin der Berliner Philharmoniker" (Press release). Berlin Philharmonic Orchestra. Retrieved 3 November 2017. ^ Kate Connolly (21 May 2008). "Musicians flee Philharmonic fire in Berlin". The Guardian. Retrieved 22 May 2008. ^ Nicholas Kulish and Daniel J. Wakin (21 May 2008). "Fire Under Control at Home of Berlin Philharmonic". The New York Times. Retrieved 22 May 2008. ^ Daniel J. Wakin (22 May 2008). "Hall Interior in Berlin Intact After Fire". The New York Times. Retrieved 22 May 2008. ^ Kate Connolly (19 December 2008). "The Berlin Phil – live in your own front room". The Guardian. Retrieved 14 October 2015. ^ Philharmoniker, Berliner. "Live im Kino 2017/2018". www.berliner-philharmoniker.de. Retrieved 20 March 2018. ^ "Honorary Membership for Mariss Jansons". Berliner Philharmoniker. 2018. Retrieved 2 January 2019. ^ "Winners". GRAMMY.com. Retrieved 9 June 2018.